Originally from India, the Sylvester Date Palm can now be found throughout the world in the most luxurious hotels and resort destinations. 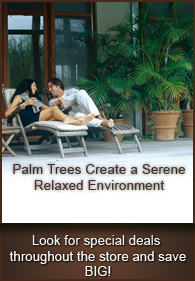 The Sylvester Date Palm can now also be found throughout luxury homes and renowned golf courses. It is also commonly referred to as the Wild Date palm and the Silver Date Palm. With it’s large greenish-silver fronds that dart into the air, the Sylvester Date Palm Tree creates a majestic appeal in any landscape. The Sylvester Date Palm Tree when properly pruned will have a diamond shape knobs which are from the old frond which have withered away. The overall appearance of a Sylvester Date Palm is magnificently beautiful and when placed in the right environment around the right lighting, it can be dazzling. The Sylvester Date Palm Tree not only looks beautiful but its also a rugged palm tree which can acclimate to cold and hot temperatures with no ill-effect on its fronds or trunk. 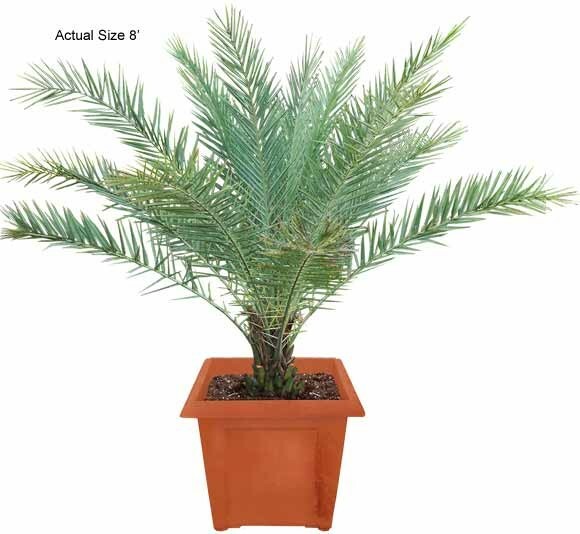 The Sylvester Date Palm can withstand cold freezes and times of drought. Let the Sylvester Date Palm Tree grace your landscape and leave the envying to your neighbors. For more photos of the Sylvester Date Palm, visit our Sylvester Date Palm Photo Gallery, it’s packed with vivid pictures of the Sylvester Date Palm for indoor and outdoor uses!